For anyone (like this author) waiting for the Adidas miCoach Smart Run 2 to arrive… don't hold your breath. It looks as if the German sports giant has given up on GPS running watches – at least its own branded ones. "We're not going to see a new running watch from Adidas for a while," Stacey Burr, VP of wearable sports electronics at Adidas told us. "There will be some additional hardware in the future that we're very excited about but we're looking, on the running side, at how we can bring our algorithms and coaching and training plans to other device platforms, in addition to Smart Run." It looks as if Adidas wants to tread a similar path to Nike, who recently partnered up with Apple on its Series 2 smartwatch. You can get a special edition Nike+ Series 2 Watch and the Run Club app is available across Apple's entire new range. "It's a tougher game on the hardware side now," Burr told us. "You really have to look at what can an individual company bring forward that's unique. When we first launched Smart Run there were not a load of running watches and hardware available out there. Now, the ecosystem for hardware is changing dramatically as larger hardware companies come into the space. "You have to look at what you do really well and, in our case, we think it's the algorithms, training plans and the coaching protocols. We need to proliferate across wider platforms so we can reach more people." 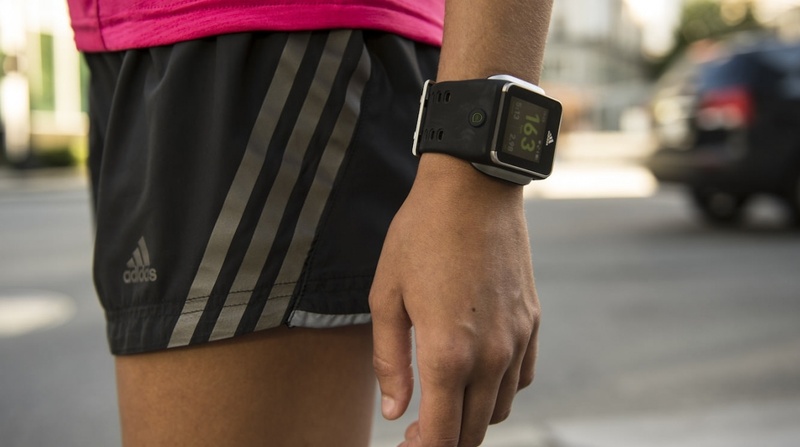 The Adidas miCoach Smart Run was originally released back in 2013 but, while the hardware is clunky and dated by today's standards, Adidas has continued to update the impressive miCoach ecosystem and its Train & Run app has evolved at a rapid rate. Don't forget that Adidas coughed up €220 million to buy Runtastic last year, giving the company access to 70 million users and, we'd imagine, a heck of a lot of expertise and technical patents. So while it's disappointing that it looks like a Smart Run sequel won't be landing, the move to a more software driven focus is understandable. Let's hope that dedicated watchOS, Tizen and Android Wear Train & Run apps land soon – with GPS now more prolific across the smartwatch ecosystem, it's surely no brainer.